There is no hotter striker on the local football circuit than Netherton United’s Tom Randall. The fleet-footed forward made it four consecutive hat-tricks in the Peterborough Premier Division during a 4-1 win at Crowland on Saturday (April 2). Randall also bagged trebles against Holbeach United Reserves, ICA Sports and Stilton United. He now has 28 goals for the season, behind only Ollie Maltby of runaway leaders Moulton Harrox who took his tally for the season to 34 with a goal in a 4-2 win over Peterborough Sports Reserves. Eric Makate also scored for Netherton at Crowland for whom Conah Hunt replied. The city side are now fifth in the table. Harrox could go a whopping 20 points clear at the top if they beat Stilton United at Broad Lane tomorrow (April 5). Saturday’s match with Sports was a battle of the top two and Moulton enjoyed the perfect start with a first-minute goal from centre-back Johnny Clay. Jamie Graham equalised following a controversially-awarded penalty, but the home side eased clear with the help of two goals from Ian Bradbury. Central defender George Edwards also scored for Sports. Whittlesey Athletic have now leap-frogged Sports into second as they laid down a marker for next month’s PFA Senior Cup Final at Peterborough United’s ABAX Stadium. Whittlesey will play Langtoft United in that showpiece final, a team they beat 4-0 at Feldale Field on Saturday. Big Matt Heron scored all four goals. Pinchbeck United’s strong run of form continued at they won 4-1 at ICA Sports. Tony Edwards (2), Tyler Wright and Louis Sae Bae scored the goals for a team on an eight-game winning streak in league and cup. Brothers Mark and Ritchie Baines scored in Stilton’s 3-1 win at Deeping Rangers Reserves. Kieran McKenna also scored for Stilton with Keir O’Sullivan replying for the home side. Bottom club Riverside fought hard before succumbing 4-3 at home to Thorney. Diogo Lopes (2) and Geres Gil Matos netted for the city side. After six straight defeats Uppingham Town recorded a welcome 1-0 win at lowly Leverington, while Ketton won for the first time in five matches, 2-1 at Sawtry, who have now lost nine Premier Division matches in a row. Peterborough Sports Reserves are in action again tomorrow night when visiting city rivals AFC Stanground for a Premier Division game at Yaxley FC. 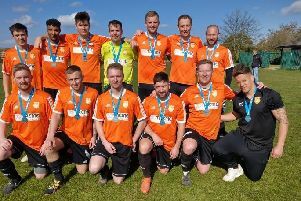 Stanground Sports won the big game in Division Three against Bretton North End. They took the honours 5-2 and are now just three points behind Bretton with two games in hand. Dean Giglio and Ricki Goodale both netted twice for Stanground and Goodale was one of three players sent off. Bretton’s Ricky Rozario and Harry Woodward also received their marching orders. Goodale was also sent off when the two sides met in February. Netherton United 4 (Randall 3, Makate).